The news that the Pakistan Telecommunication Authority (PTA) is looking to block unregistered mobile phones after October 20th spread like wildfire at the beginning of last week. The PTA announced that it planned on releasing the Device Identification, Registration and Blocking System (DIRBS) in order to regulate ‘fake or smuggled sets which post health hazards’. According to PTA, the DIRBS will help to regulate the issue of counterfeit mobile sets which directly have an affect on mobile phone distributors and operators, consumers and the government. While the move in itself has had very mixed reactions from the general public, a delegation from All Mobile Union had a meeting with the Minister of State regarding the issue and conveyed their concerns regarding such a system being introduced in Pakistan. The final verdict regarding DIRBS being introduced is still on hold, however we’d like to highlight some of our concerns with the system and its application in Pakistan. According to a report released by PTA in May 2018, the number of mobile phones subscribers in Pakistan has crossed 150 million and 59 million of these subscribers use 3G/4G services. This implies many users in Pakistan are not necessarily smartphone users but we have a significant amount of the population using all sorts of smart phones. Pakistan’s GDP per capita income is $1624 which means most of the population cannot afford high end smartphones which is the reason for the proliferation of cheaper alternatives which are not heavy on the pocket and also provide the basic services essential for a smartphone. Introducing DIRBS would have a significant impact on the most disadvantaged smartphone users in Pakistan and will also affect the wider smartphone market in the country. 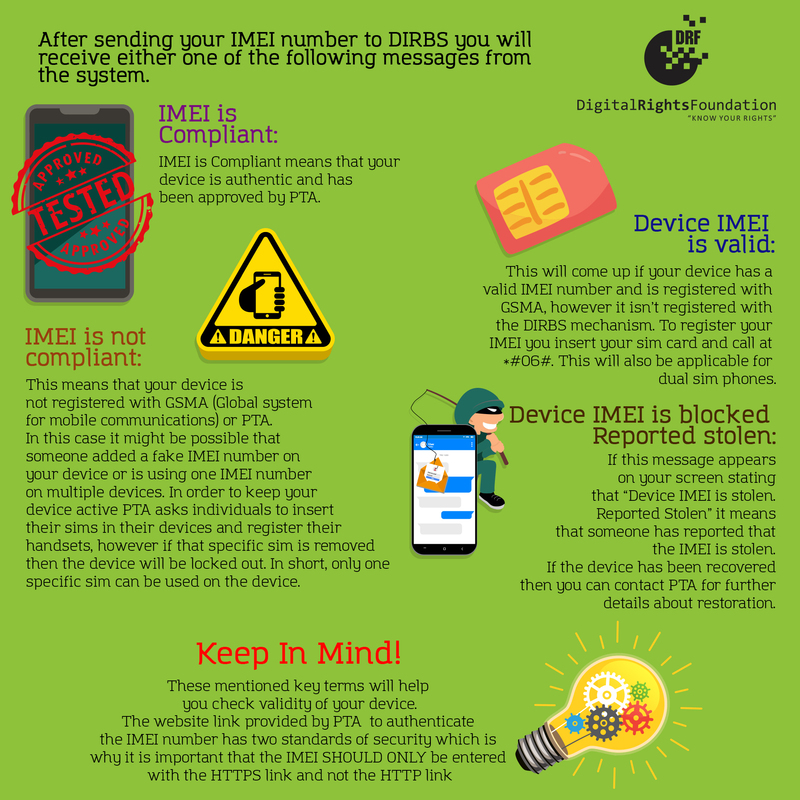 DIRBS requires the IMEI number (International Mobile Equipment Identity number) which is a potentially useful tool to trace mobile and other SIM-enabled devices however the application of the same may be impractical. DIRBS would require every user to send their IMEI to 8484 to check the status of registration with the PTA. PTA having this information regarding a device is unnecessary and will have a significant impact on user privacy and data. 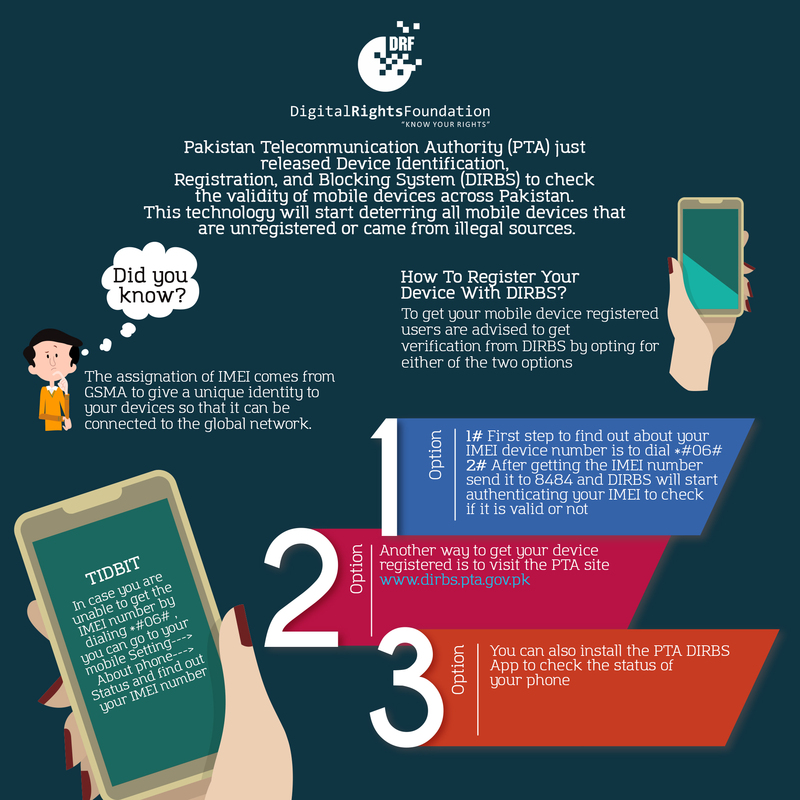 With mandatory biometric systems for registration of mobile sims in Pakistan, this additional layer of registration is superfluous, especially since the PTA has not provided any specific reasons for this move. DIRBS is a system that keeps substantial information about the user with itself, but do we really know why this information is needed? The system’s data protection and privacy policies are not defined by PTA and users still have no idea who will have access to this information. While DIRBS might be a good step for regulation on unregistered mobile phones, we still need to keep the larger political landscape of Pakistan in mind while introducing such a system. Campaigns around buying a mobile phone which is approved by PTA is the first step to go and such concrete measures should only be adopted when there are minimal users of unregistered mobile phone users in Pakistan.